Gardenias are perfect plants for you if you want a one-two punch of elegant flowers and sweet scent. These shrubs bloom all summer long, offering their rich perfume to decks, patios, balconies, entryways, and landscapes. Here are our tips for growing fabulous gardenias. Gardenias can grow in full sun if you make sure to keep them moist and avoid letting them dry out, especially in hot, windy weather. If you're not as good about watering, a spot with morning sun and some afternoon shade might be a better bet – especially if you live in a hot-summer area. While they're beautiful, gardenias aren't particularly drought tolerant—especially if you grow them in containers. Water when the top inch or so of the soil or potting mix dries. In container gardens, that may mean daily waterings, especially if your gardenia is situated in a particularly hot spot. Tip: Spread a couple of inches of mulch, such as shredded wood, over the top of the potting mix to help reduce evaporation so your gardenias stay moist longer. When growing gardenias in pots or planters, it's important to use a mix designed for container garden use. Don't use garden soil, which can have drainage issues. Like camellias, azaleas, and rhododendrons, gardenias like to grow in slightly acidic conditions, so incorporating a little garden sulfur or aluminum sulfate into the potting mix at planting time can help keep them happy. Look around and you may discover there are a number of different gardenias available. You can often find varieties with double, rose-like flowers, as well as single blooms that look more like magnolias. 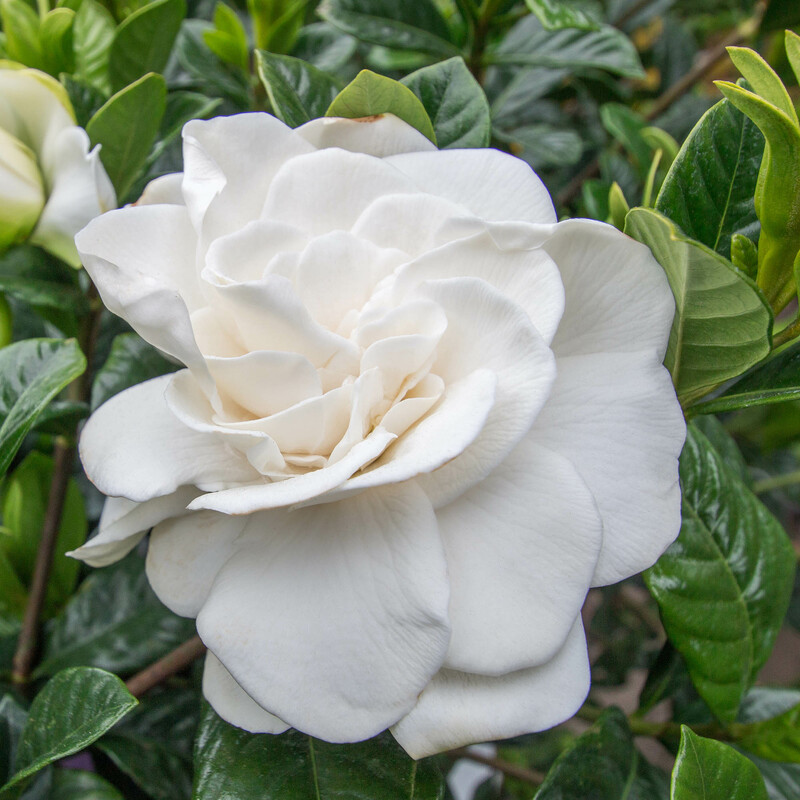 A few gardenias have foliage that's splashed or streaked with yellow, cream, or white variegation to give them extra appeal. Additionally, gardenias are commonly grown in shrub or tree forms. Shrub forms stay dense and bushy; tree forms, also called standards, add a more formal feel to your favorite outdoor living spaces. Dwarf varieties stay extra tidy and compact, rarely growing more than 3 feet tall and wide. If you live in Zones 9 to 11, you can enjoy your gardenia outdoors all year long. In Zone 8, where they may be less reliably hardy, you can keep your gardenia in a garage or shed for the winter where it gets a little extra protection from the elements. Just be sure to water this evergreen plant periodically so it doesn't completely dry out. If you live in colder zones, you can consider your gardenia an annual to be replaced the next growing season. Or, if you have a cool, bright spot in your home, you can try bringing it inside and wintering it indoors. Learn more about growing gardenias outdoors.